As everyone knows by now, a meeting of the Opposition’s "Unity Roundtable" in Carabobo state ended in blows last week as various local factions’ frustration over negotiations ahead of September’s parliamentary vote came to a head. The news has been greeted with the typical oppo roll-of-the-eyes, as example umpteen of the opposition’s ingrained cluelessness. But I wonder if we’re not missing the point here. 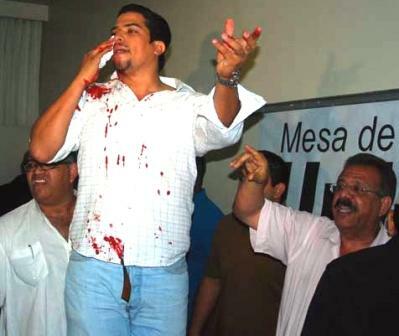 After all, these guys in Carabobo might have screwed up, but what they did not do is the one thing that would really hurt the opposition in September: walk out. In its own way, that’s progress. For once, the instinct that could really screw up our chances come September – that deep, atavistic reflex to say "if I can’t get my way in your unity table I’m going to go off and start my own unity table!" – gave way to a decision to tough it out even as frustration reached boiling point. At long last, ‘fight’ won over ‘flight’ within an intra-opposition dispute. The opposition is starting to grasp one fundamental truth: walking out is not an option. Anything – even beating each other up – is preferable.